(305 x 457 mm) 13 x 19 in. (358 x 530 mm) 17.7 x 24 in. THANGKA 17.2 x 26.3 in. (437 x 668 mm) 17.2 x 26.3 in. NOTE: A similar unbrocaded thangka of this Machig Labdron painting by Sunlal is now available for sale. This new version is slightly larger with more detail in the background landscape. Priced at GBP £1,460.00. Machig Labdron, or Machik Labkyi Dronma (circa 1055-1153), was the famous yogini who founded the Chod lineage of practice in Tibet, and her main teacher was the Indian yogin-mahasiddha, Padampa Sangye. The name Machig means 'One-Mother', and Lab refers to the province that she came from in Southern Tibet. The Chod or 'cutting' practice is derived from the early Prajnaparamita or 'Perfection of Wisdom' teachings, which seek to overcome the self-cherishing attitude and the belief in an inherently existing self, which are viewed as the two main obscurations to self-liberation. These obscurations are symbolized in the sacrificial form of one's own body, which is visualized as an 'object of cutting' (Tib. chodyul) that is chopped into small pieces and presented to the hungry ghosts and tormented spirits as a feast offering. The Chod rite is traditionally performed as a solitary practice in the terrifying nocturnal setting of a haunted charnel ground. Such fearful places bear little resemblance to cemeteries or churchyards in the West, which are really gardens of love and remembrance. The beautiful and hypnotic prayers that accompany the Chod practice are sung to the rhythm of a hand bell and a large wooden Chod drum or damaru. 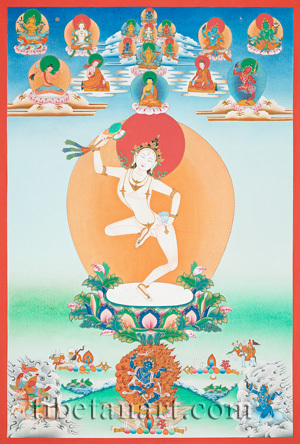 Machig Labdron stands upon a white moon disc and a multicolored lotus in dancing bow-and-arrow posture, with the heel of her right foot drawn up to her pubic area. She is beautiful, youthful, radiant and white in colour, and her naked body is adorned with the golden ornaments of a five-jeweled crown; earrings; a short, medium and long necklace; bracelets, armlets and anklets. She has a sweetly smiling face with three bow-shaped eyes. Half of her sapphire-black hair is piled-up into a topknot, while the other half hangs freely behind her back. With her raised right hand she rattles a chod-damaru fashioned from two human skulls, which has four striking pellets and a triple-valance of silk brocade adorning its golden handle. With her left hand she rings an upturned bell, which she holds at the level of her hip. Shakyamuni Buddha appears upon the lotus directly above Machig Labdron's red halo, and above Shakyamuni is the four-armed wisdom goddess, Prajnaparamita. She is golden-orange in colour and sits with her first pair of hands resting upon her lap in dhyana-mudra, and her second pair of hands holding aloft a rosary and a text on the 'Perfection of Wisdom'. Seated amidst the clouds above Prajnaparamita are the sambhogakaya manifestations of the 'Five Buddhas', with white Vairocana at the centre, blue Akshobhya in the east, yellow Ratnasambhava in the south, red Amitabha in the west, and green Amoghasiddhi in the north. Crowning the top of this assembly is blue Vajradhara, the primordial or 'Sixth Buddha', who is the source of the main lineages of tantric transmission in the Sarma or later schools of Indo-Tibetan Buddhism. Seated upon cloud-borne cushions to the right and left of Shakyamuni are an Indian Pandit wearing a red hat, and the second Karmapa, Karma Pakshi, who wears his black vajra-crown. On the cloud-borne lotus to the right or 'method' side of the Pandit is Machig's Indian guru, Padampa Sangye, who wears the typical loincloth and red meditation belt of a mahasiddha, and holds a damaru and a thighbone trumpet in his right and left hands. And on the cloud-borne lotus to the left or 'wisdom' side of Karma Pakshi is the red female yidam deity Vajravarahi, who holds a curved knife in her right hand, a skull-cup in her left hand, and supports a khatvanga in the crook of her left arm. Above Padampa Sangye is lion-mounted Manjushri, who is orange in colour and holds two lotuses that bear his wisdom attributes of a sword and book. Next to Manjushri is the white aspect of the long-life deity Amitayus, who sits with his two hands resting upon his lap in the dhyana-mudra of meditation. Above Vajrayogini is Green Tara, and next to Tara is blue Vajra Dakini, who holds a curved knife and a skull-cup in her right and left hands. In the lower left corner is the red warrior-protector Tsi'u Marpo, who rides upon a red horse and holds a spear-flag and a rope-snare. In the lower right corner is the wrathful protector of the Chod lineage, Chang-zhon-ma, who is one of a group of three enemy-destroying goddesses that respectively ride upon a many-headed wolf, tigress and vixen. Chang-zhon-ma is black, naked, three-eyed and extremely ferocious. She rides upon a three-headed 'iron-wolf', and holds a curved knife and a skull-cup in her right and left hands. At the bottom centre is the ferocious Chod goddess, Troma Nagmo (Skt. Khrodakali), the 'Wrathful Black Woman', who manifests as an extremely fierce blue-black aspect of Vajravarahi. In bow-and-arrow posture Troma tramples upon a corpse that rests upon a golden sun disc, a pink lotus, and a triangular vajra-rock formation. She wears the five bone ornaments, a five-skull crown, a garland of severed heads, a tiger-skin loincloth, an elephant-skin shawl, and a human-skin girdle. She abides in a blazing mass of wisdom fire, and wields the attributes of a mummified corpse and a thighbone trumpet in her right and left hands. Behind the three rows of stacked jewels in the lower landscape, are various groups of the 'seven precious jewels' of the chakravartin or universal monarch. These are: the precious wheel, jewel, queen, minister, elephant, horse and general; which all appear together as an assembly in the lower right area. As symbols or insignia these seven precious jewels are represented by: a rhinoceros horn (horse), white tusks (elephant), round earrings (queen), square earrings (minister), lozenges (general), blazing gem (jewel), and a branch of red coral (wheel). Behind the left row of jewels are the five sensory offerings of: a mirror (sight), a lute (sound), a golden bowl of tormas or sacrificial cakes (taste), a conch shell full of perfume (smell), and a silk cloth (touch).